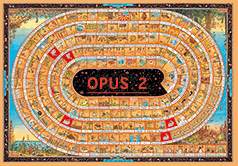 For the millennium in the year 2000, I created a gigantic puzzle with 8,000 pieces for the publishing house Heye Verlag in Munich, Germany. 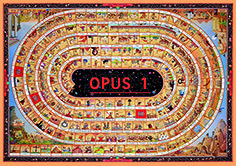 It showed the history of man from the birth of Jesus Christ until today (Opus 1). Ten years later I got gripped by passion again to finish this large historical fresco by painting the suite, or rather the early history of the earth and mankind, from the big bang to the beginning of the Christian era (Opus 2). I would like to invite you to accompany the process of my work from the historical and iconographical research, the scribbles and the lining to the final colouring in ink. Nearly a thousand pictures and several months of continuous work will be necessary which I am looking forward to sharing with you. Your opinion, your critical remarks, your ideas, your sketches will not only be welcome but also highly necessary for the success of this website! Have a fun visit and thank you in advance!